Want some pretty fun, or even kicked-up, sandwich ideas for using your homemade sourdough english muffins? Here ya go — this quick video gives you plenty. More ideas? Please share in the comments! See more: egg salad, chicken salad, wild salmon salad, sloppy joes, and hamburgers. 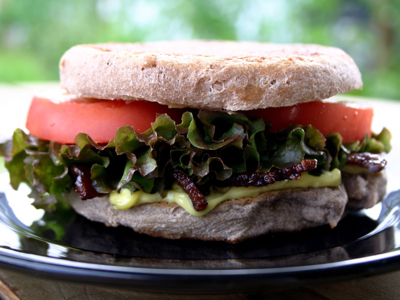 The video contains more mouth-watering ideas, like for personal pizzas, BLTs or tuna melts! This is a video from inside the Sourdough eCourse — we shared it alongside Erin's video demonstration of making the ever-so-popular homemade sourdough english muffins. Bonus! Make your sandwiches probiotic by using raw cheese or lacto-fermented mayonnaise, mustard, ketchup, guacamole, or hummus. How do you kick-up your english muffins? Please share! These look sooooo good! I’ve made sourdough bread before, but the starter usually get’s kind of smelly and I haven’t found the perfect combo of GF flours to use either since my hubby doesn’t like a strong sourdough taste…..are they really that easy to do? I made my first liver spread the other day and it was SO GOOD. Very easy, here ya go. Steam your liver until cooked to your liking, I did all-the-way cooked. Finely chop your onion and cook it in butter until golden. Hard boil two eggs. Mince everything together, add sea salt, and eat like it’s amazing, because it is. Very good with mayo. Just so you know, this is coming from a new ex-vegan, so if I can eat anybody can! BURGERS! You are brilliant! Homemade whole wheat hambugers buns made with sourdough takes so much longer! This is something that can be started in the morning, cooked in the afternoon, and served with burgers for supper! Yes, this is going on my list. I made your sourdough crackers and they have become a family favorite. Planning on tackling the chocolate cake next, but these biscuits will definitely have to go on the list. It’s been so long since I made sourdough English Muffins. We like to add our sauerkraut (aka viking slaw around here) on top of our burgers for added LF. I am planning to make burgers this weekend so maybe I do a batch of muffins. Great video! Thanks so much for this adventure Wardee. The sourdough routine is gradually becoming part of the normal daily round and not a big ‘extra’.